On Wednesday’s afternoon, as usual, I was sitting in the tent in solidarity with Khader Adnan. There were a few people there but I am always not satisfied with the number of people joining the protest for this person who is dying to live, this legend that no hunger, pain or pressure could break his determination to live free and dignified. Every day my dissatisfaction gets greater as I wake up without hearing of his release. Around 2 pm, the number of people usually declines and that means that there are not many things to do. Making sure that I’d be one of the last people who left the tent, I stayed there thinking of Khader’s health, which is deteriorating as time passes. Time couldn’t matter more than it does now. According to a doctor from Physicians for Human Rights-Israel, who was able to visit Khader the night of February 14, for his fifth medical examination since his arrest, Khader is under a very direct threat of death. All of his muscles, including his heart and his stomach, are under threat of disintegrating, and his immune system could cease to function at any moment. Khader’s body is at high risk of sudden heart attack or total organ failure, which would cause imminent death. I was busy brainstorming about what I would do next to raise the awareness about his case and get people to move. Suddenly, 3 physically disabled people including a woman entered the tent on a cart designed for people with such disabilities, attracting all eyes on them. Each one was sticking a Palestinian flag to their carts and brought a beautiful banner combined with photos of Khader’s with Mahatma Gandhi’s. What can be more meaningful, expressive, touching and true than the message this banner delivers? 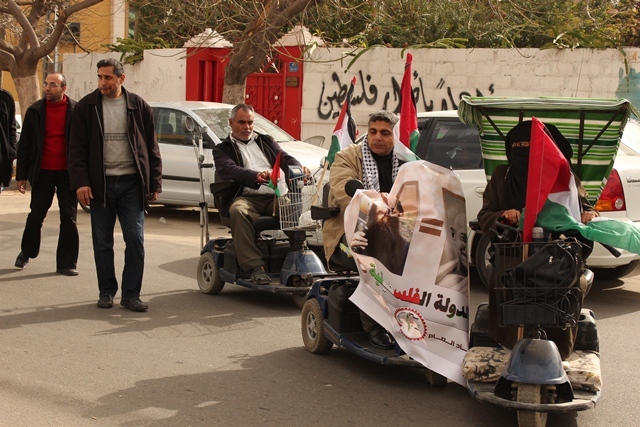 Those disabled came to send a message to the whole world in general and India in specific on behalf the General Union of Disabled Palestinians (GUDP). The decision of the Israeli military court of our brother Khader Adnan’s case is an illegal and racist one. It has failed all the efforts that were done by whoever tried to contribute. The Israeli courts still refuses to follow the rules and the international and humanitarian demands and still sticks to the prejudiced system of administrative detention, which contradicts human rights. Khader Adnan continues his illegal detention in Zeif hospital in Safed after two months on hunger strike. In accordance to Yasir Arafat, Abu Ammar said “this revolution is not only the revolution of Palestine but it’s also of every free human around the world.” Thus, we, the General Union for Disabled Palestinians, announce February the 15th as patriotic, democratic and international day of solidarity with the detainee Khader Adnan. What the hero Gandhi and his supporters did using peaceful resistance, Khader Adnan is doing with his battle of hunger striking since December 17. We proudly declare Khader Adnan as the Gandhi of 2012. Our brave prisoners have always challenged the policies of repression and injustice and confronted with their bare chests and their empty stomachs all forms of torture and persecution that were exercised against them. It’s important that you know that there are more than 50 disabled Palestinians behind Israeli bars, despite their permanent disabilities caused by the Israeli occupation. Moreover, more than 250 children are held captive by Israel, committing scandalous violations of their rights, since their arrests have led to varying brutalities, from tying hands and legs, preventing them of sleep and taking breaks and standing a military trial, violating the fourth article of Geneve agreement. They exercise all these inhumane actions against prisoners including children and disabled under what they fabricate as the emergency law. Isn’t that an obvious evidence of Israeli Occupation’s condemnation against children and disabled detainees? However, we have complete faith that those who paid their freedom as a price for all our freedoms will be free with their heads held high to celebrate their people’s glories and steadfastness. 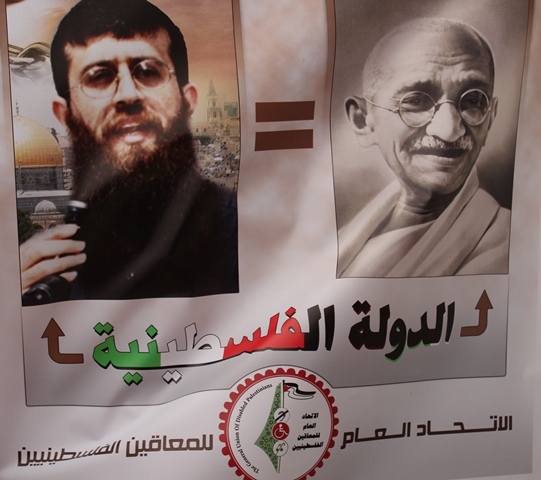 Khader Adnan, the Gandhi of Palestine, equals Gandhi, the founder of the Indian country, in his battle of empty stomach and peaceful resistance. We strongly call for Gandhi’s grandchildren and the Arab league to stand with our people’s issues, especially the prisoners’ issue, and to put the release of Khader, detained children and the disabled on the top of your priorities in the international, Arabic and Islamic forums to rescue our prisoners’ lives, and most important, Khader’s life. In conclusion, we appeal to every free human around the world not to forget Palestinian prisoners inside the unjust Israeli jails while making your breakfast, or returning home peacefully. Speed recovery for our injured heroes.